Died on the 12th September 1940. Took off from Hemswell flying a Hampden 1 Aircraft P 2117 PL on Operation Brest but on return crash landed at Boscombe Down, Wiltshire on the night of the 23rd/24th August 1940. The airframe of this aircraft was salvaged and became 2270M for instructional purposes. Pilot Officer Drewry survived the crash but was killed in a car accident on the 12th September 1940. He died from a fracture of the skull when the car that he was driving hit another motor vehicle. The accident happened on the Lincoln to Brigg road and his death registered in Welton, County of Lincoln. Son of Richard Walter and Lucy Elizabeth Drewry of Lenton, Nottingham. He is buried in a Commonwealth War Grave in Rothley Cemetery owned by William Burton, Aberfeldy, The Ridings, Rothley. 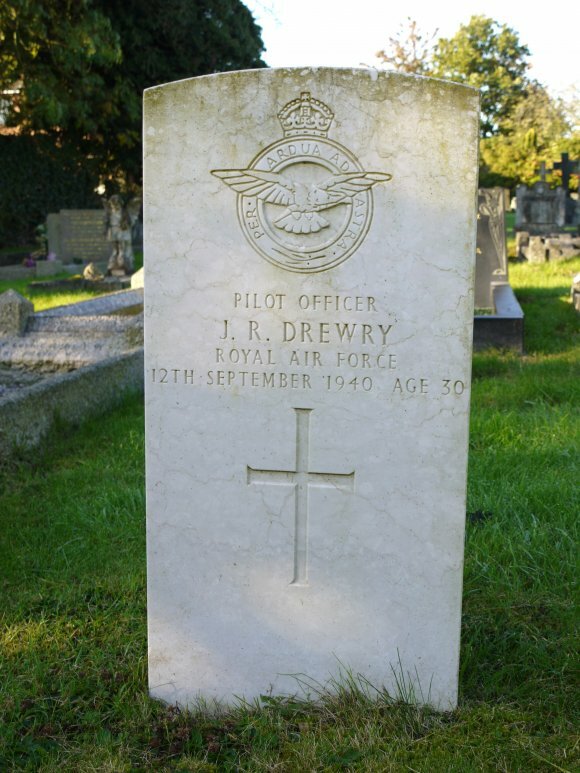 Pilot Officer Drewry cannot be traced on any war memorial apart from his war grave in Rothley Cemetery. The village of Lenton does not have a war memorial for their dead of WW2 but in 2015 is compiling a Roll of Honour which will now show his name. The search for information on Pilot Officer Drewry led me to Lenton, his place of birth, and correspondence with Steve Zaleski, Editor of the Lenton Times. The Lenton Historical Society was compiling a list of those who died in WW2 as their War Memorial only listed those who died in 1914-1918 so only then did they realise that here was a name that was unknown to them. Here is some of the correspondence that I had with Stefan to give some background to what became a search for information for Rothley and Lenton who share the loss of Pilot Officer John Richard Drewry. In May last year we received an email from Marion Vincent who wanted to know whether a John Richard Drewry was known to us as he clearly had Lenton connections.Marion was enquiring because she was researching Rothley's war dead. Rothley Cemetery contains nine graves listed on the Commonwealth War Graves Commission's website. Of the six who died during the Second World War, the website gave a Rothley address for the next of kin for three of these men.For another there was a Berkshire address while the fifth had no additional information whatsoever.At least with the sixth man, Pilot Officer John Richard Drewry, the website revealed that he was thirty years old when he died in 1940 and that his parents were Richard Walter and Lucy Elizabeth Drewry. With a specific age and quite a distinctive surname it was fairly easy to pinpoint in the general register office's index of births that John Richard Drewry had probably been born in Nottingham in 1910.Just to make sure Marion sent off for his birth certificate. This revealed that John Richard had been born at 4 Sherwin Road, Lenton, Nottingham on … … 1910.His parents were indeed, Richard Walter Drewry and Lucy Elizabeth Drewry (née Page) and his father was a draper's assistant.Access to the 1911 census revealed that John Richard was their first child and that his parents had been married for five years.Richard Walter was a Nottingham man but Lucy Elizabeth had been born in Bottesford.The fourth member of the household was Elsie Slater, a fifteen year old domestic servant.They were still living at 4 Sherwin Road, Lenton.In fact this address was to remain their family home until at least 1941.John Richard was destined to be an only child as the Drewrys were to have no other children. 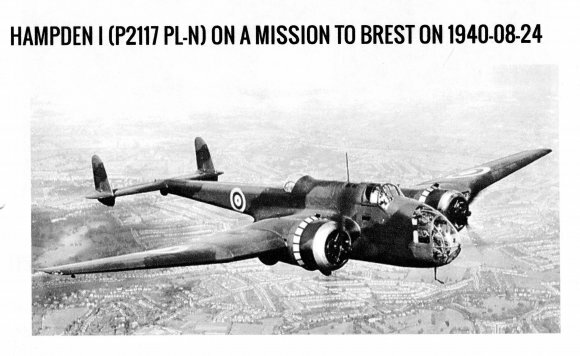 Marion has discovered that a month before his death Pilot Officer Drewry, 77202, of 144 Squadron [Operation Brest] had been involved in a flying accident.During the night of 23rd/24th of August 1940 he was at the controls of a Hampden 1 [P2117 PL], which had left RAF Hemswell, in Lincolnshire and was approaching Boscombe Down in Wiltshire when he was forced to crash land the plane. The four-man crew all survived and the airframe was later salvaged, renumbered 2270M, and used for instructional purposes. Now we turn to one of the more puzzling aspects of the story.Why was John Richard Drewry buried in Rothley Cemetery rather than here in Nottingham?His mother had died the previous year.Her death notice in the Nottingham Evening Post for 8 September 1939 reads: DREWRY On September 7th at Sherwin Road, Lucy Elizabeth, wife of Richard Walter, aged 62. Interment in the Church Cemetery, Nottingham. When the burial records for the Church Cemetery were checked it turns out there must have been a last minute change of plan as his mother was not buried there. Some other local cemetery must have been chosen or perhaps her body was cremated. What is certain is that Lucy Elizabeth Drewry was not buried at Rothley. Marion was able to check out the Rothley burial records. The grave in which John Richard Drewry was buried had been purchased in March 1940 by a William Burton of Aberfeldy, The Tidings, Rothley. This was undoubtedly the same person who acted as executor to John Richard's will. Listed in the 1941 Probate Index the entry reads: DREWRY John Richard, of 84 Main-street, Kirby Muxloe Leicestershire and of 4 Sherwin-road Lenton Nottingham died 12 September 1940 on war service Probate Birmingham 10 February to William Burton cardboard box manufacturer. Effects £1268 16s. 6d. Marion thinks that William Burton may have been one of the Burton family involved in 'Newbold and Burton,' shoe manufacturers operating in the nearby village of Sileby and that William's role would have involved making the cardboard boxes in which the pairs of finished shoes were put before being sent out to the retail outlets.John Richard Drewry may have been working for him or perhaps there was a romantic attachment between John Richard and a member of the Burton family.Then again there may have been a more direct family link between the Drewrys and the Burtons.If there was, it has yet to come to light. One final piece of evidence, however, does suggest that a family link may be the answer.This relates to Richard Walter Drewry.The 1941 Nottingham directory still gave him as resident at 4 Sherwin Road.Come 1945 the Nottingham electoral registers list Austin and Gertrude Nurse as the current residents.We lose sight of Richard Walter until his death, which occurred in 1956 when he was aged 84.The Probate Index for 1957 has the following entry for him: DREWRY Richard Walter of 36 Shirley-road Leicester died 22 November 1956 Probate Birmingham 18 February to William Burton cardboard box manufacturer. Effects £1482 9s. 1d.If John Richard had been merely an employee or a potential suitor then surely William Burton wouldn't have gone on to act as his father's executor some sixteen years later.If anyone can shed any further light on this, both Marion and ourselves would like to hear from them. For those wondering where No.4 Sherwin Road is, we have to report that the property is no longer exists.It was situated on the section of Sherwin Road that lies on the other side of the Lenton end of Castle Boulevard.No.4 along with a number of adjacent properties were demolished as part of the Willoughby Street area redevelopment which took place in the 1960s/early 70s. The site of No.4 was incorporated into car park attached to the new 17th/21st Lancers public house, which now houses the Tesco Express outlet. The outcome of the project by Lenton Local History Society to identify all those with Lenton connections who died in the Second World War resulted in the profiles that were published in Lenton Times Issue Nos. 27 and 28.Until Marion Vincent got in touch we were unaware of John Richard Drewry.So now he can be added to the list and we are most grateful to Marion for sharing the results of her research with us. XHTML 1.0 validated. WCAG compliant. Page generated in 0.1291 seconds.